Hey, I’m Griffin and this is my blog. 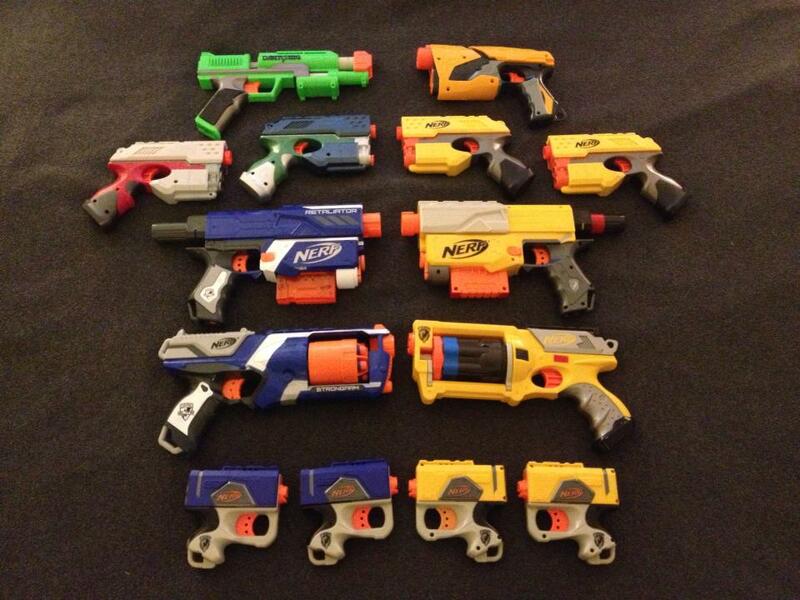 Some may ask, how did you get into Nerf Blasters? Well, a million years ago my roommate and I were bored one day, so we went out to Toys R Us. For some unknown reason we bought a couple of blasters. I think I bought an Eagle Eye and he bought a Chain Blazer. Over time more and more blasters were purchased and hidden throughout the apartment: Secret shot in the couch, Crossbow in the kitchen, etc… My roommate was the one that started modding but got bored with it shortly after. Fast forward to four years ago when I started my new job. It was a start up company. They wanted Nerf to be part of the culture. 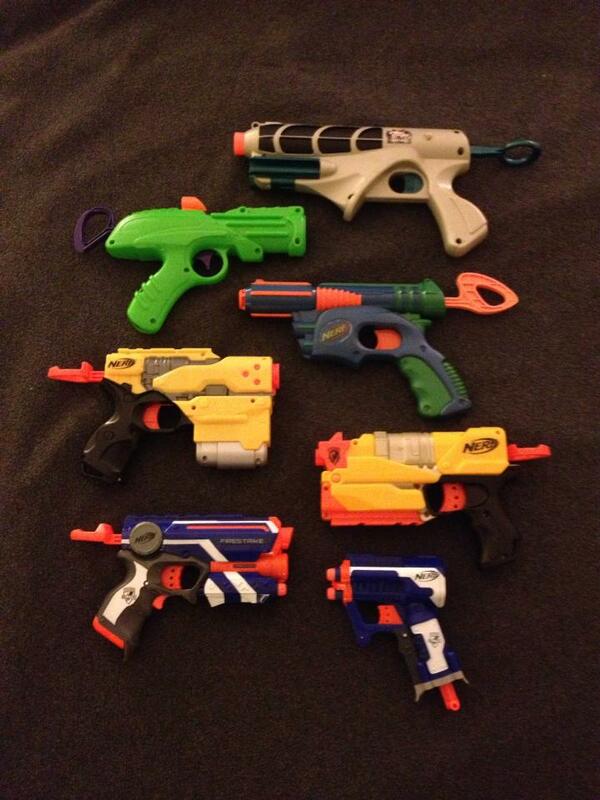 I did research on mods and such as they began to build up an armory. Along with my actual title, they now call me the Nerf Arsenal Manager since I do the AR mods on the old blasters, assign blasters to new employees, and make suggestions when they want to make new purchases. It’s a pretty sweet gig if you can get it. In case you think I’m kidding, here is the video (courtesy of Attention Era Media!) that really clinched it. I figure that there are a few people out there in the same boat as our new employees. 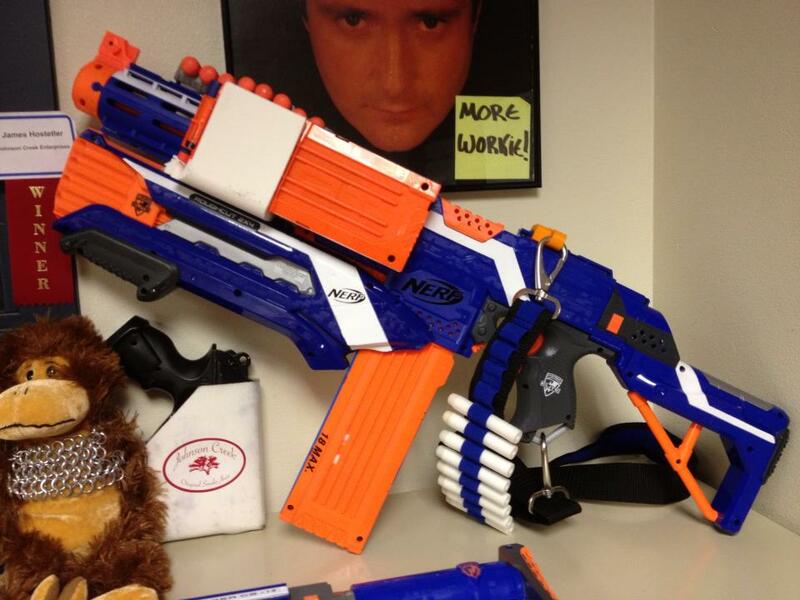 So, if you work in an office with a Nerf culture but have no knowledge of Nerf, maybe some of my reviews can point you in the right direction when it comes to picking out a blaster and, at least, defending yourself. Feel free to stop by the official Facebook page for the inside scoop on upcoming articles and behind-the-scenes topics and comments.